For 26 seasons, Andy Musser spoke to — and for — Phillies fans. The former team announcer died Sunday at age 74. I gasped when I looked up Musser on http://www.sportscollectors.net/. How many collectors had contacted Musser since his departure after the 2001 season? “Andy was always in his quote ‘Second Hot Dog’ (role) to Harry Kalas, and I heard a clip of him on the radio today where he compared himself to a middle reliever that never had much as far as stats but always came through when you needed him. He was one of those distinct voices that are part of my childhood much like Harry and Richie Ashburn, but he never was much of a fan favorite but was never sure of as to why. He had very distinct voice that was hard to forget. I wrote to him in care of his home, just went nosing around on the internet until I found what I thought could be the right address and mailed off the Phillies announcers card I had from when I was growing up. He signed and sent it back with the letter. It actually was mailed out on a Monday and was back on Wednesday so he holds my personal record with fastest reply LOL. The reason I wrote to him was I didnt have any autographs of him and wanted him as part of my collection. 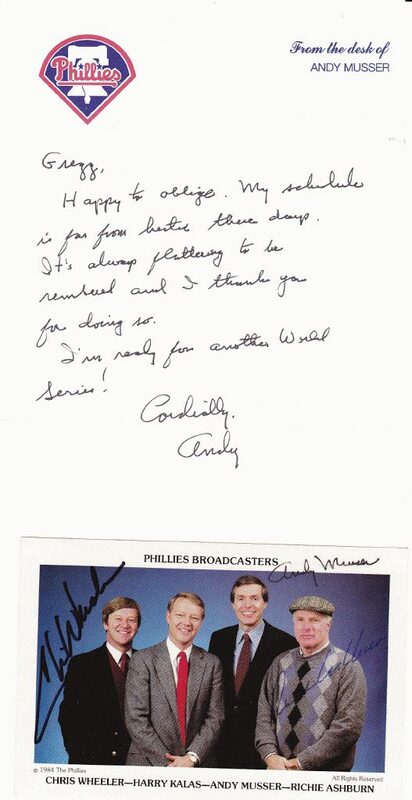 Also have another Phillies announcer story from this summer if you would like to hear it: I mailed to current announcer Tom McCarthy and it was picture of the 2008 announcers. It was signed only by Harry Kalas and I figured I would try to get it completed by all of them. So I mailed to Tom and that also came back with a great letter about Harry and signed by everybody. I found this additional tribute to Musser worth sharing! Coming Friday: Do you think baseball autograph collecting is an all-male domain? Think again!